This course is an investigation of ecological anthropology, the study of human relations with the environment. Ecological anthropologists ask how human populations shape the environments they live in, and, in turn, how relations with the environment shape culture and social organization. The course is organized around the following topics: (1) ecology, its history, and the historical use of ecological concepts within anthropology; (2) various schools of ecological anthropology, including cultural ecology, human ecology, ethnoecology, and systems approaches; and (3) approaches to ecological limits (inscribed in such notions as human carrying capacity, sustainablity, and the like), and their critiques. ANTH 415, Ecological Science and Human Society, is one of two core courses in environmental anthropology for undergraduates offered at the University of Hawai'i, Mānoa. ANTH 415 focuses on the relationship between ecology and social organization, on natural science models of resource-use, and on such approaches to anthropology as ethno-ecology, human and cultural ecology, and the ecosystem approach and its application within anthropology. In contrast, ANTH 482 focuses on such issues as the political economy of natural resource use, political ecology, the cultural politics of environment, and the environmental implications of globalization and development. 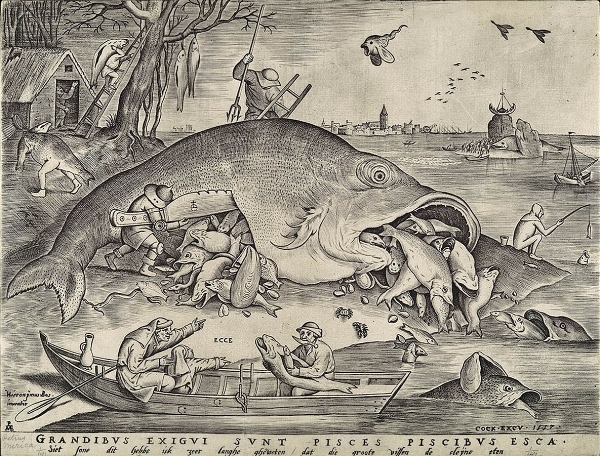 *image credit: Pieter Bruegel the Elder. 1557. Big Fish Eat Little Fish. Engraving by Pieter van der Heyden. 9 x 11 5/8 in. (22.9 x 29.6 cm). Collection of the Metropolitan Museum of Art.